Nature has a way of blending in to itself. But every once in a while a striking phenomenon stands out as a reminder of the beauty and complexity of the planet we call home. 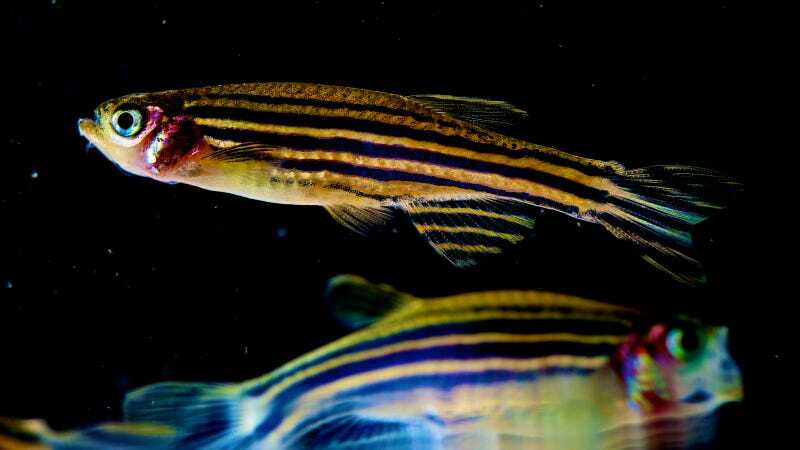 A new research project designed to simulate how zebrafish get their stripes offers one such reminder. The model, created by researchers at Brown University and described in the Journal of the Royal Society Interface, uses the development of the dark blue and bright yellow stripes on these small freshwater fish as an example of how complex and dynamic structures form naturally. According to Alexandria Volkening, a graduate student and Brown's Division of Applied Mathematics and the lead author on the new paper, zebrafish stripes are the result of interplay between three types of pigment cells: black melanophores, yellow xanthophores and silvery/bluish iridophores. Each person, like a cell, can move around and interact with the other people in the room. Volkening told Fusion that the results of their mathematical model suggest that cell birth and death select stripe width, but cell migration maintains this width. She said that zebrafish stripes seem to form on their own due interactions between the pigment cells themselves, involving both short and long-range cell communication— There's no "prepattern" that's already there. "The long-range communication is especially exciting," she said. "Biologists have observed pigment cells reaching out long tendrils called pseudopodia toward other cells as far as half a stripe away." Zebrafish develop from transparent embryos to full size fish in just a few months, making it easy for scientists to track their development. Volkening said the wealth of experimental data on the fish was one reason they chose to study it. The model Volkening and Bjorn Sandstede, chair of Brown's Division of Applied Mathematics and a co-author of the paper, used mimicked the arrangement of cells in a fish just a few weeks old. It then grows in a way that approximates the growth of the fish. Volkening explained the process in more layman's terms, saying the pigment cells on zebrafish skin can be compared to a group of parents and children walking around in a room. "Each person, like a cell, can move around and interact with the other people in the room," she said. "The children may be attracted to other children in the room, and parents might want to talk to other parents." She said that short-range interactions, such as chatting and handshakes, and long-range communications, such as a parent "reaching out a long arm to tap a wandering child’s shoulder," could both happen. "In a similar way that the parents and children may become distinct groups if the children play together and the adults talk at a distance, the pigment cells on the fish skin could separate into dark and light regions," she said. "In both cases, the core mechanism is that locally, you want to talk to people in your age group, but, at the same time, you want to make sure your parents or children aren’t too far away." She said the result is a pattern, same as happens with the zebrafish stripes. But the analogy, and the underlying mathematical model, only explain so much. "The question of how zebrafish get their stripes is not solved yet," said Volkening. "This an area where both biologists and mathematicians can contribute together." According to a 2014 study by the Max Planck Institute for Developmental Biology, the silvery and the yellow cells on the zebrafish are also able to switch cell shape and color, depending on their location. Nobel prize laureate Christiane Nüsslein-Volhard, director of the Department for Genetics at the Max Planck Institute for Developmental Biology and one of the authors of the study, said that the findings of the study could help explain the behaviors behind the great diversity of color in fish and other animals. “These findings inform our way of thinking about color pattern formation in other fish, but also in animals which are not accessible to direct observation during development such as peacocks, tigers and zebras,” she said, apparently while wondering how his cat got its stripes.